So now it is time to sort out the projects/UFOs/WIPs that you want to finish over the next three months. Take a photo of each one and make your list. If you like you can use our Finish-A-Long Planner to list your projects and keep track of progress. It also has all link-up dates for the year, and the hashtags that we would use. Or use any method that works for you. Please ensure that you have at least STARTED your projects – pulled fabric with a pattern is considered a project started – and remember it is only a FINISHED project that will get you an entry toward the above listed prizes. So while we love to see your bee blocks, the “finish” is when they are a completed, usable project. The 2019 Q2 link for your list of proposed finishes is now open below, on my blog and on each of the hosting blogs. You need only link your list once, on ONE host blog, and the link will show up on all the host blogs. If you are using Flickr or Instagram, post a mosaic of your projects and put your list in the description. Don’t forget to include your unique hashtag. We also ask that you become part of the FAL community. Please check out the links of others – visit and comment on their lists. We all need encouragement to get those finishes done, so please share some of your own too. If you want you can follow us on Facebook: Finish-A-Long and/or on Instagram: @finishalong, too. We’ll post encouragement during the quarter and reminders when the finishes link up opens at the end of the quarter. When creating your list there is one thing to remember – No deductions for not completing something so – Aim High! Nothing to lose!! Well now, get that list together and get linked up. Reminder to link up for the FAL! Hello again! The Finish-a-long fun continues…next week we’ll go back to my regular old stuff. A quick reminder that the Quarter 1 link up for all your finishes closes on Tuesday, April 9, 2019 at 11 pm EST. You still have a few more days to finish a project or two and link them up to be eligible for prizes. The link up can be found HERE or on any of the 2019 FAL hosts blogs. Please include only one finished project for each post that you link up, so that each finish counts as one entry in the (random) prize draw. Please include a link to your original list in each post of your finishes (on Instagram the link is the unique tag #2019FALQ1yourname to be used in the Q1 list post, and in any Q1 finish post). Please visit some of the other participants and leave a friendly comment, we all love to get those! And we (the global hosts) just wrapped up “Tutorial Week” which has been part of the Finish-A-Long since its inception. The tutorials are varied, interesting, and usually helpful, so take some time to investigate and visit the blogs below! And whether you had a lot of finishes, or none at all this quarter, or you missed Finish-A-Long Q1 altogether, you can always join in for Quarter 2. The link opens up April 10th for your proposed finishes. We hope you will join us! This post is part of the Finish-A-Long Q1 tutorial week. Hello, and if you’re visiting here from the Finish-a-long, welcome to my blog! I’m Nicole and I’m an enthusiastic contemporary quilter. I’m a whiz at quilt math and making my own patterns. I also love quilt history and am working towards becoming a certified quilt judge. Today I want to show you a bit about how to bury your threads. This is a good skill to have and is useful in several different situations. When would you bury your quilting threads? When you totally goofed and missed an area of quilting. This is a perfect example of the first. Leanne has used multiple colours of threads to match her piecing, and all the thread ends need to be taken care of. Image used with permission from Leanne Chahley of She Can Quilt. Her blog and Instagram. This picture is an example of the last. Susan inadvertently skipped one of the yellow diamonds. Image used with permission from Susan Smith of Stitched By Susan Instagram and Facebook. So that’s the why and the when. On to the how! How do we bury threads anyway? You need a needle called a self-threading needle. There are two styles of self-threading needles, and a DIY work around. a self-threading needle, a spiral eye/side eye, and the DIY self-threading needle. The DIY needle is pretty basic. Knot a small length of contrasting thread through the eye of a regular needle, making a loop. This loop becomes a giant needle eye, which is then super easy to thread. How does it work? Or what am I actually doing with this awesome needle? Your bobbin thread should already be on the top of your quilt and near your top thread. Tie them together in a square or reef knot. Pop BOTH threads into the eye of your needle. Run the needle about an inch (2.5cm) away, making sure that you can’t see the needle on the back of your quilt. You want the threads to be in the batting layer, not sticking out on the back of the quilt! I like to align the needle parallel to and close to my stitching line. This will also help hide your thread tails. You want to make sure that the knot you tied also goes into the batting layer, or at least into the fabric. Trim the thread where it comes out of the quilt top. Discard your excess thread and move on to the next area. BONUS TIP: bury thread tails as you go. Somehow it takes less time than if you do them all together at the end. There you go! I hope this gives you another technique to improve your quilting. Thanks so much for reading. Feel free to take a look around my blog and see what else I’m working on. 2019 Finish-a-long Q1 finishes linkup! And wow, is that a mouthful or what! I hope you’ve had success with your projects so far this year. Here’s your chance to link up the ones that you did in fact finish. No shame if you didn’t get them all done, that’s the same boat I’m in myself this time around. That’s the beauty of the finish-a-long – you get to try again! Please become part of the FAL community. Check out the links of others and leave a comment. We all need encouragement so let’s applaud each other. 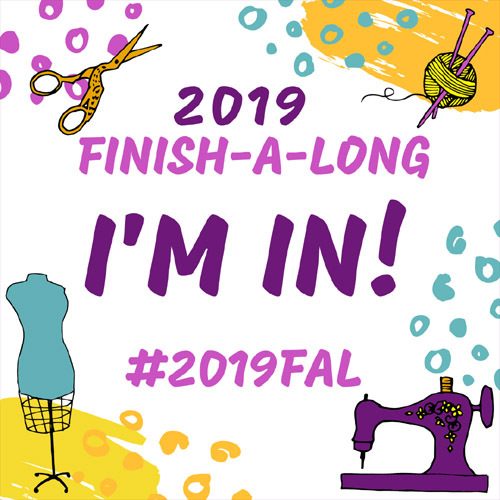 The 2019 FAL Facebook page is HERE and you can follow us on Instagram @finishalong. The Q1 Finishes link will stay open from now thru 11 pm, EST, Tuesday, April 9, 2019 – as we are global, you might want to check your time zone to determine your last possible time to link. You can also see how much time is left below the linked up images on the right. It is best to link up your finishes early and if you have a last minute one, add that one later so you don’t miss out. The prizes will be awarded as soon as we can verify all the entries and do the drawings. We will post the winners on each host’s blog. Lastly, don’t forget to start making your Q2 list as the next LIST link opens on Wednesday, April 10, 2019. I’m looking forward to seeing what you DID get finished. Ready? Here’s the linky link for 2019 Q1 Finishes. Way more info is here. There’s likely going to be an ad here. I’m not a fan but what can you do! ?